Wow! Excellent work - I have not moved my Scangauge over to the C-Max yet because I'm still learning the standard displays. Some of these parameters look really interesting! You must take off the door to the OBD connection in the C-Max to plug-in the Scangauge because the Scangauge plug is to big to fit through to openning. My dealer did this for me and I can always put the door back on when I remove my Scangauge to sell the car. Carl and I have been working with "James Delong the Inventor of the Scangauge" for years, but Carl is the brains behind the programming. I got Carl and James together in 2007 so Ford owners can have the information from the Scangauge we have today. Good bunch of people! Where did you mount your display? I have it sitting in front of the PRNDL display now, but have not mounted it yet. I will mount it so I can view the road ahead at the same time for safety reasons. I'll let you know where soon when I plan for making a bracket for the mount. Here is how I mounted mine (images below). Also, on the C-Max (not sure about the Energi), there are 2 OBD II ports. 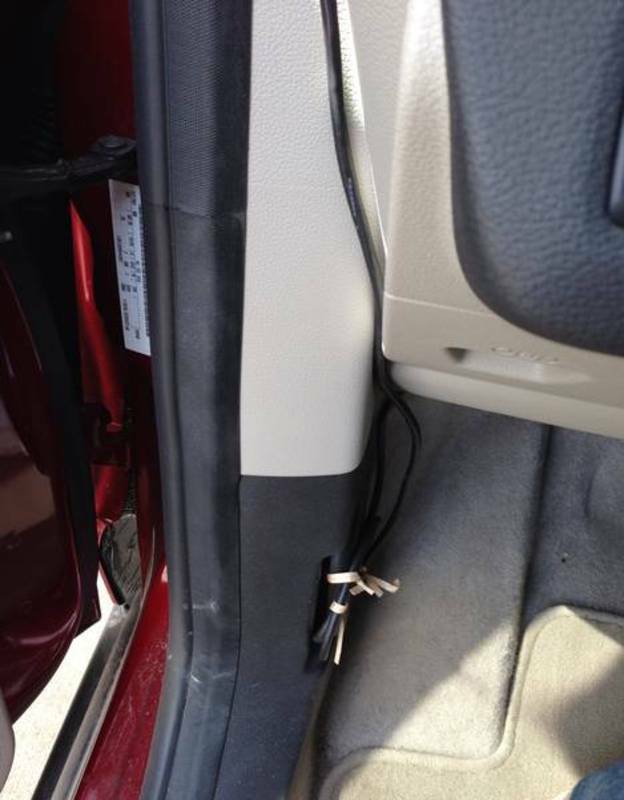 In addition to the one behind the door, there is another one down below the dash that can be accessed directly. That's great! I didn't think to check for a second OBD connection. I can put the door back on now. I'm thinking about the Scangauge MPG calibration on the Energi. It seems like the calibration procedure for MPG at fill-ups is not going to be practical, because almost all tanks of fuel will include varying number and amount of electric recharges. 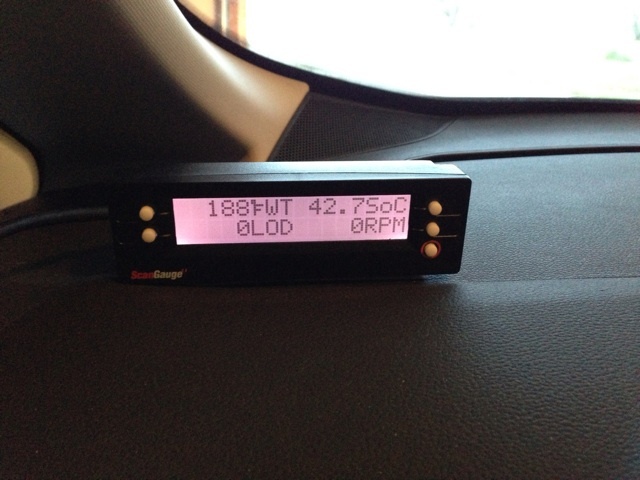 I have a problem with instant and trip mpg on my Scangauge with the C-Max. It's a little off and only briefly shows 9999 for instant mpg when I go into EV. The Scangauge shows a small rate of flow when I'm in EV for gallons per hour: .07. It may be that I need to have the firmware updated though. The Scangauge shows a small rate of flow when I'm in EV for gallons per hour: .07. It may be that I need to have the firmware updated though. Mine says 0.06. Poking around on the internet, it seems that quite a few different kinds of cars do this and I haven't found any way around it. Thanks for the codes and the hint on the extra OBD port. I plugged in the cable to that port under the dashboard. There was a metal tab there which I used to twist tie all the loops of extra cable so they won't tangle my feet. Then I ran the cable behind the dashboard and was able to fish it out beneath the steering column. There's a plastic piece there where it can also be twist tied to keep it out of trouble. The gauge is on top of the steering column. By far the cleanest ScanGauge setup I've done without removing any panels. Edited by viajero, 08 June 2013 - 11:13 AM. A full charge is between 99 and 100 percent. The range runs out and the display switches to the "little battery" at about 21% SoC. In hybrid mode, SoC only varies plus or minus 3 percent or so. I haven't driven it a lot since installing the gauge, but it hasn't gone much below 19%. It varies a bit, but about 98% SoC is where the ICE turns on if you shift into L.
You can find out just how much regen you get from going down a hill. Now I'm looking forward to driving more big hills. 113 or 114 degrees F is where the ICE will turn on, even if there is range left in the battery. While charging in the garage, BaT is usually in the high 90s. I've seen it get as hot as 111 F sitting in the sun on a hot day. Luckily I have a garage at home and at work, so that rarely happens. MxD. This one always reads 35.0. MxC, AMP, MeT, TmE, and MoT didn't return any values. GnT was missing a digit on Mth. I tried adding a 0 but it didn't return any value. Yesterday it was around 109F here. My wife reports that after the car was sitting in a parking lot all afternoon, when driving home in EV, at some point the ICE came on, even though charge was about 50%. Lucky us, even hotter today and very windy. I ended up mounting a velcro strip and the SGII there also. The LED is protected from the sun like all the other gauges by the top overhang. I can do without the PRNDL lights because the eCVT will not shift into a gear like R or P while moving forward. The 3 X-Gauges I monitor is SOC, battery temp and interior temp. My SOC does drop from 99% after a charge, but I think the battery fans bring it down a bit before the battery gets cooled down. I think the hottest my battery has gotten is 98Fso far. When the battery gets down to ~20%, I start a P&G till the CAT heats up for going EV again. At around 16%, the car will go EV for the glide after the Pulse. I head home or a place I can get a free L2 charge to make it back home. My lifetime regen braking is at 98% now, so I'm satisfied with that. My SOC does drop from 99% after a charge, but I think the battery fans bring it down a bit before the battery gets cooled down. I had always seen it above 99%, but then I'd always come out at least a couple hours after it said it finished charging. Yesterday I went out just after it finished. The glow ring was off, and the Scangauge said 95%. As I was monkeying with it, it started charging up again. It looks like after the initial charge it cools off and "bounces" a few times and eventually settles close to full. I did some ICE driving yesterday and this morning and noticed a few more things. The battery has a lot of thermal inertia. Once you get it warm, it takes a long time to cool down if it's just sitting there - the fans don't run when you turn the car off. I parked it with a battery temp of 105 F and after shopping for quite a while it was still 105 when I got back. Outside temp was about 90 F (it was under a shade). Then I got back onto a 75 mph highway in EV mode. The battery temperature went up rapidly. At 111 and rising the ICE turned on. 18% SoC according to the ScanGauge is half full point of the "little battery". My car seems very reluctant to let the charge drop below this level. I thought I'd seen it get well below half in the past but I haven't the last two days when I've been paying attention to it. Before the C-Max Energi was released some people speculated that air cooling wouldn't provide adequate cooling for the battery pack. And I think by the standards of a pure EV, the cooling is inadequate. It can't dissipate heat as fast as the battery generates heat when driving in EV mode. The battery temperature just keeps increasing, slowly if you're driving slowly on a cool day, rapidly if you're driving fast on a hot day. But, they can get away with that because it's a plug-in hybrid with relatively short EV range. Most of the time the battery will run out of charge before it gets too hot. And for those times when it looks like it's going to get too hot, the ICE can kick in to take the load off. I suspect we'll be seeing more of this as the heat of summer approaches. There was an SAE article mentioned earlier on these forums talking about hybrid vs. Energi battery packs. I found it again, and it also talks about battery cooling and seems to match my hypothesis. The all-electric Focus has to use active liquid cooling for its battery pack because it has no ICE to back it up. That article was posted also on greenhybrid.com to answer a question I ask regarding an aux A/C on the energi on 5/4/13. I made my decision to buy an energy that day. As you can see, the article talks about the aux A/C on Escape Hybrids prior to 2010 and my concerns were about battery management with the new plug-in models. I've posted here that I run my cabin A/C 100% of the time at 72F, but since CarlD gave me those X-Gauge codes, I can keep an eye on battery temperature now. Also, I monitor Interior cabin temperature from those X-Gauge codes and I'm seeing the cabin doesn't cool down as much with the battery pulling cool air from the cabin. For this reason, I am setting the cabin A/C to a lower setting than 72F to see the effects of it cooling the battery down even more. One reason I haven't had the engine start during EV mode is because my battery is cooler when I stop to charge it. I think you get problems with the engine starting after the battery exceeds 113F, but maybe someone here can confirm that now that we have a battery temperature x-gauge.